Dan is a pleasure to deal with. He is personable, friendly and accommodating. His guidance in the area of color, design and in the selection of materials is helpful and inspiring. He is enthusiastic and detail oriented; it is obvious that he takes great pride in his work and settles for nothing less than a picture perfect result. Thank you Rhona! I enjoyed helping design & remodel your bathroom. You're reactions to the work were priceless! We're so happy you love your new bathroom. Thank you for being a wonderful customer to work for! Dan and his team were great! After quickly getting to know them I knew I could trust them in my home and getting the work done. They cleaned up every day as if no one was there even if it took extra time after the job was done. Very detail oriented and clean clean work! Dan and Constructive Design were great! I used them for two projects at my home. I was totally happy with the quality and service both times. When he painted my living room, they cleaned up everyday so we were not tripping on their equipment and supplies and made sure we were thoroughly happy before signing off on the job. Highly recommend! "Obviously very happy and pleased" 6 Projects Completed! " All the work has been superb"
1. Installation of eleven (11) new wooden Marvin Windows (including a large bow window). We replaced all of our old vinyl windows that leaked, had mold, and were warped. The original windows had not been installed properly. 2. Renovation of our main bathroom (and updating our half bathroom) which involved a full gut down to studs and updating of 90% of existing plumbing to all applicable codes. 3. Replaced and installed attic insulation. 4. Renovation of our old 60’s kitchen which required a full gut and design. 5 & 6. Renovation of two (2) bedrooms including removal of wallpaper, remediation of mold, skim coating the walls, painting, new electrical receptacles and new carpeting. We have an upcoming small project of replacing the front and rear storm doors. We were obviously very happy and pleased with the first project that we have not hesitated to use Dan and Constructive Design Inc. on any project we decide to do in our home. All the work has been superb. Never having done major renovations Dan took all our wants and needs into consideration and helped design and choose everything from layout, materials, fixtures, appliances, etc. He also gave us many ideas and options and showed plenty of patience being that we are older and stuck in the “old world”. He introduced us to a new, more modern and functional lifestyle which we appreciate. Speaking on a personal note Dan is ethical, extremely professional, respectful, honest, warm and educated. It’s evident he’s a perfectionist and expects only the best in his work and nothing less. 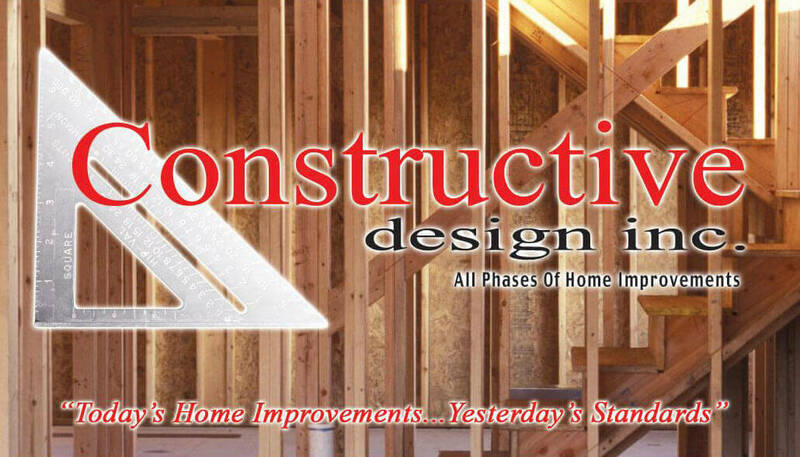 We highly recommend Dan and Constructive Design Inc. for any home repair or renovation. They are extremely respectful, protective and neat with the rest of your home and all its contents. In the future we plan on redoing our living-dining rooms and of course Dan and Constructive Design Inc. will be doing the project. Dan Rummo of Constructive Design is a consummate professional in his field. Mr. Dan Rummo of Constructive Design is a consummate professional in his field. This is the second and third construction projects he has done for me. Why did I hire him to take on these two projects? Because I could see from the first one (he completely rebuilt my chimney some years ago) that this is a man who, when he does a job, does it right; he is not satisfied until each step of the process is completed to his and the customer's satisfaction, and his standards are high. This recent job involved his building two completely customized, one-of-a-kind, storage sheds for me; a larger one for my bigger tools and garden equipment, along with a separate mini-shed to house my generator. While I knew approximately how I wanted the two sheds to be constructed, I did not know enough about construction to be able to give him the details, and there is where Mr. Rummo's ability to improvise on the job proved invaluable, enabling me to trust in Mr. Rummo's judgment based on his long and extensive experience. Moreover, he came each day promptly at the time he had indicated he would, worked from the beginning to the end of each day wasting no time, left a clean worksite at the end of each day, and kept careful cost records of the time and materials involved. In summary, I would not hesitate to call on him again should I be in need of someone to do construction work on my property. We used Danny for a number of small projects that needed to be finished before we listed our house. He was referred by a friend and we are very happy with the work. He was punctual, friendly and did great work for a good price. I highly recommend Constructive Design and would use them again in the future. "Did an Amazing Job." "Thorough and detail oriented" "Trusted"
Dan remodeled my kitchen and did an amazing job. Very thorough and detail oriented. My family has dust allergies and he made sure the work area was kept clean and even assisted when my floors were done by another company. He went above and beyond, a pleasure to work with! I trusted him in my home and knew he would treat it like his own. Thanks Dan! "Dan came to our rescue when our home was flooded by Superstorm Sandy"
Dan came to our rescue when our home was flooded by Superstorm Sandy. Constructive Design completed the restoration of our home. Dan Rummo was totally involved with the process from start to finish. The work was done professionally & was completed in as timely a fashion as could be under some financial constraints. Dan was most helpful in the redecorating of our home & he was instrumental in assisting with bathroom & kitchen materials as well as decorative design ideas & details. Dan Rummo is very knowledgeable in ALL aspects of construction which was what we needed during our time of need. You did spot on meticulous work. I appreciate that you left the work areas so clean each day. It was also a pleasure to work with you and I would gladly refer you to anyone needing any of the services you perform. Thank you for your professionalism and quality workmanship.